The Amish Buckingham Office Lateral File Cabinet, Credenza and Optional Bookcase Top provides a three-piece set of solid wood furniture to serve your executive office. This solid wood office furniture is attractive and impressive, offering plenty of storage space and solid wood style to make your office space functional and appealing. Lateral Filing Cabinet: This spacious cabinet keeps all your records organized and easily attainable. Store letter or legal files with the adjustable metal bar provided. Storage Credenzas: Keep oversized items and records in the credenza cabinets. Solid Wood Bookcase: Display all your books and manuals as well as a few photos on the spacious shelves. The fluted angled corners and raised panels accentuate the quality of hardwood furnishings. The Buckingham is built to be strong and durable and serve your office for many years to come. 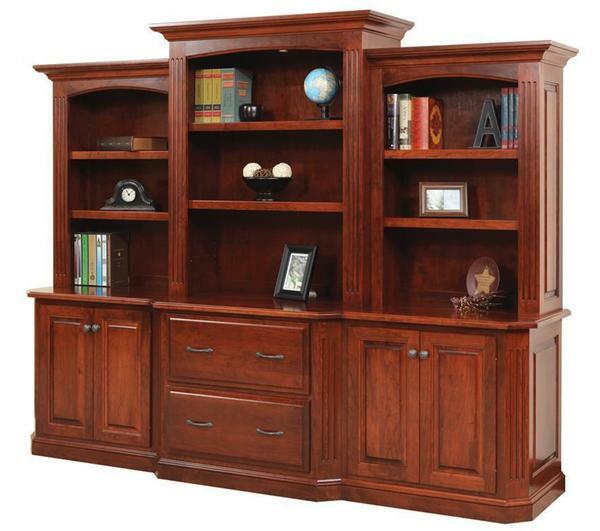 Consider the Buckingham Executive Desk to use with this beautiful storage unit. Note: Three-Piece Hutch is Not Standard.